Background: Since 1983, the Great Activities Publishing Company has been a trusted name to a generation of Physical Education teachers. 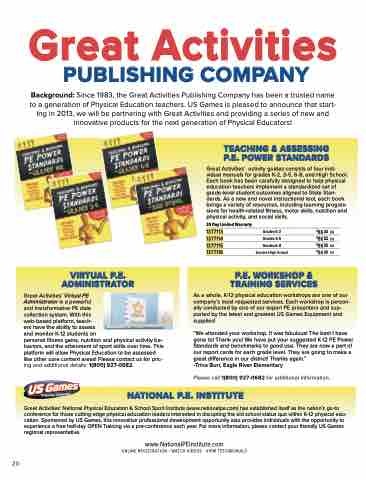 US Games is pleased to announce that start- ing in 2013, we will be partnering with Great Activities and providing a series of new and innovative products for the next generation of Physical Educators! personal fitness gains, nutrition and physical activity be- haviors, and the attainment of sport skills over time. This platform will allow Physical Education to be assessed like other core content areas! Please contact us for pric- ing and additional details: 1(800) 927-0682. Great Activities’ activity guides consists of four indi- vidual manuals for grades K-2, 3-5, 6-8, and High School. Each book has been carefully designed to help physical education teachers implement a standardized set of grade-level student outcomes aligned to State Stan- dards. As a new and novel instructional tool, each book brings a variety of resources, including learning progres- sions for health-related fitness, motor skills, nutrition and physical activity, and social skills. As a whole, K-12 physical education workshops are one of our company’s most requested services. Each workshop is person- ally conducted by one of our expert PE presenters and sup- ported by the latest and greatest US Games Equipment and supplies! Please call 1(800) 927-0682 for additional information. Great Activities’ National Physical Education & School Sport Institute (www.nationalpe.com) has established itself as the nation’s go-to conference for those cutting-edge physical education leaders interested in disrupting the old school status quo within K-12 physical edu- cation. Sponsored by US Games, this innovative professional development opportunity also provides individuals with the opportunity to experience a free half-day OPEN Training via a pre-conference each year. For more information, please contact your friendly US Games regional representative.